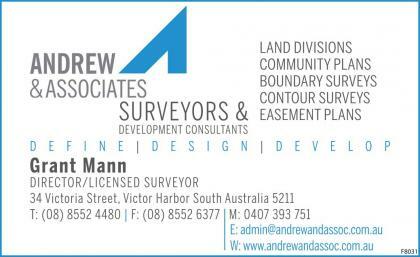 Andrew & Associates was founded in 1988. The Directors – Grant Mann, Monica Cianca, Chad Heinirch and Roy Dineen strive to maintain a professional diverse consultancy with experienced personnel that provides high quality, cost effective surveying and project management services. We assist individuals and organisations in urban & regional South Australia develop property and infrastructure assets in all aspects of land development. Our main administrative office is located in the Adelaide CBD, with a branch office located at Victor Harbor.